I know. Another toffee themed recipe. BUT before you say anything, I had no plans to post another recipe using the toffee sauce, that was until the lovely @bondsbeach used it to make granola! As soon as I saw that, I had to hop into the kitchen and experiment for myself. It took a few trials to get the flavor and consistency down, but the end result is buttery, crunchy and surprisingly, not overly sweet! So, thank you @bondsbeach for the creative inspiration!! *In my first trial I used all water, but found that it worked best with 1 TBSP of avocado oil. We’ve also been incorporating more avocado and/or coconut oil into Willow’s diet at the recommendation of our naturopath…so I’m learning to add a little more fats/oils into our meals. For those looking for a completely oil-free recipe, you can add an extra tablespoon of water or add a tablespoon of maple syrup, but know that the oil works really well in this case. **For a nut-free version, you can replace the pecan pieces for sunflower seeds or pumpkin seeds. I personally preferred the buttery flavor that the pecans brought and found that the sunflower seeds brought a little bitterness to the granola. You can also omit the nuts/seeds all together. In a large mixing bowl, whisk together the toffee sauce ingredients > coconut sugar, tahini, coconut nectar, vanilla, salt, water and oil. Mix until smooth – should take 2-3 minutes to get it all incorporated. You can also blend the ingredients until smooth. 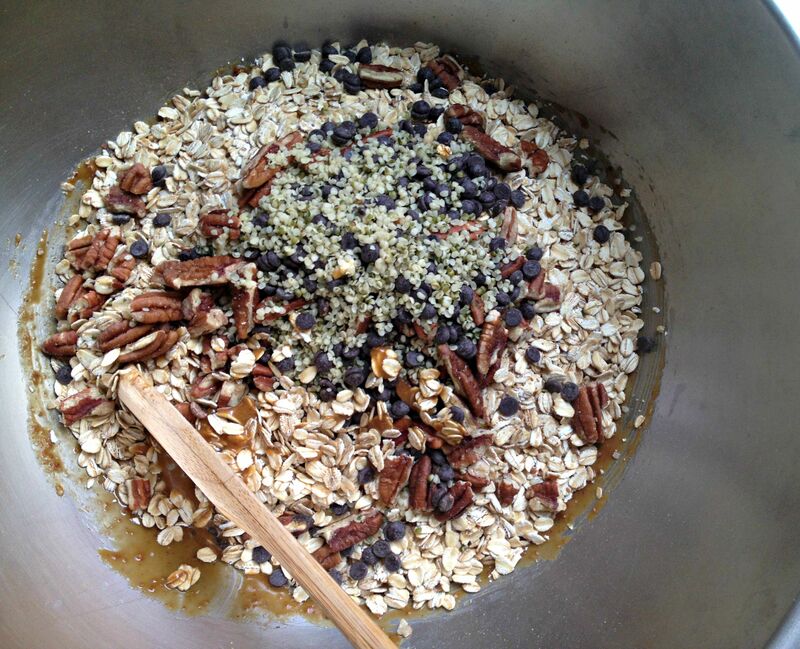 Next add in the oats, chocolate chips, pecan pieces and hemp seeds. Using a spatula or wooden spoon, stir until well combined and evenly coated. Spread the mixture onto your baking sheet into an even layer. If you don’t have a large baking sheet, you can divide this into two sheets. Bake for 35-45 minutes, flipping/stirring halfway through. You’re looking for a “dry” golden color. Remove from the oven and allow to cool for 15 minutes on the baking sheet. 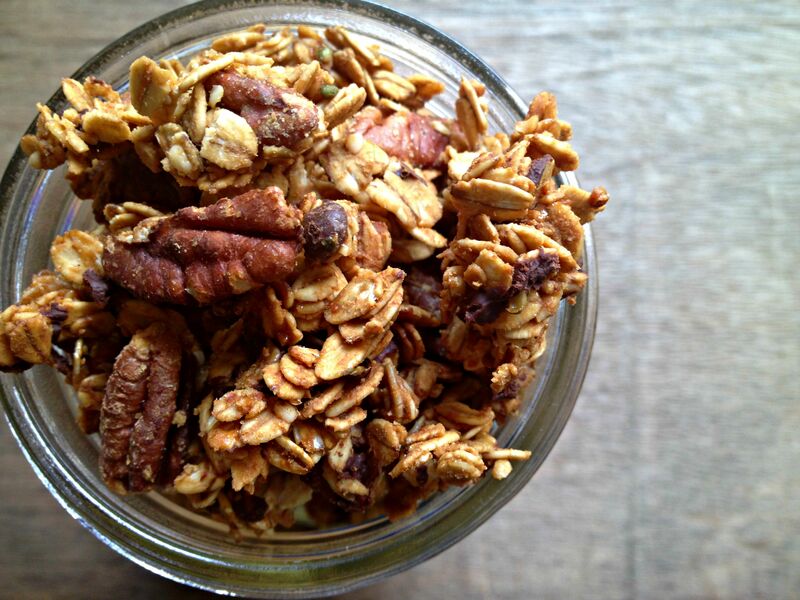 Allow the granola to cool completely before storing in airtight containers. I store mine in glass Mason jars. You can enjoy this with milk, sprinkle it on yogurt or smoothie bowls and use it as a topping for ice cream. This concludes the toffee sauce recipes…I promise! YAY! Thank you so much — I can’t wait to try it! This sounds so good! Always looking for a new granola recipe! Will definitely be making! This looks sooo incredible Mandy!! I absolutely love the idea of toffee granola! 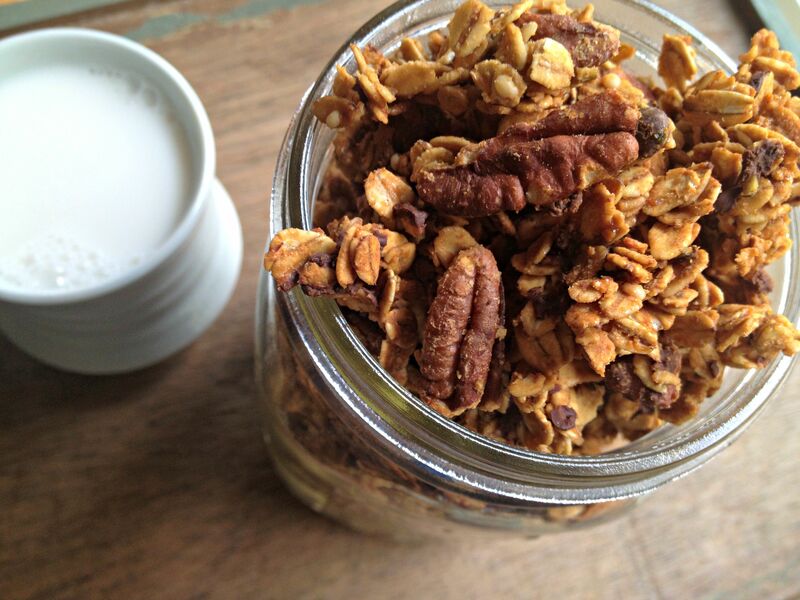 I love coconut sugar like it’s my life and I love toffee, so what a perfect idea for granola! I pretty much want to eat ALL of that! I go through granola soo fast because it’s so addicting! I cannot wait to try this! Oh that toffee again…ugh i haven’t gotten around to ordering the coconut nectar =( I know it’s pathetic…especially since I think of all your toffee recipes ALL DAY! No excuses…ordering it TODAY! Haha! Not pathetic at all! I promise, you’ll love the coconut nectar when you do get around to buying some. It has such a rich, deep flavor! You’re the best! !